1999 Enesco Mary Engelbreit Cuties Edward the Teddy Bear, approximately 12 inches tall, plush furry tan teddy bear with black stick-on eyes and pink embroidered nose. 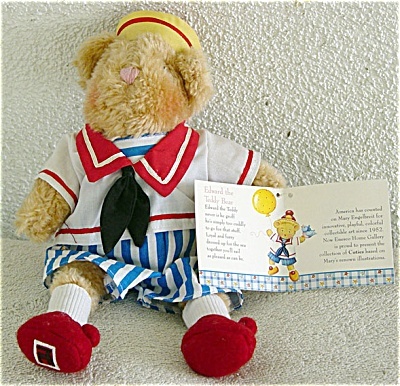 He is wearing a blue and white striped shorts jumpsuit with white with red collar and red ribbon trim and black tie sailor shirt, yellow and red sailor hat with red pompom, white socks, and red shoes with pompoms. He is stuffed with a mixture of beans and soft filling. Hard-to-find retired teddy bear plush is mint with his tag old stock. He is a great decoration for July 4th. Expand listing to view both photographs.